The US Environmental Protection Agency has confirmed that the air inside our houses is often more polluted than air outside. If you don’t smoke, most of these toxins come from cleaning products, air fresheners spray, insecticides, cooking and the like. Of course, if you DO smoke, you pretty much know that you’re steadily increasing the level of toxins in your home for people other than yourself. We suggest you keep it outside! While the levels of toxins aren’t a cause of serious illness (so don’t worry too much), they can cause low-grade issues such as low energy, poor sleep patterns, allergies, and even depression. We spend so much time in our homes that it is definitely worth doing something about it. A general home detox is easy enough to do, and stopping using harsh chemicals and pesticides is another method of reducing the toxins you are surrounded by. But don’t underestimate the power of a small plant to clean the air in your home. Remember that most of what makes up a plant is drawn from the air, mostly from gases we don’t like. Much of the information on the plants in this list comes from research by the NASA Clean Air Project, who were interested in plants which can help scrub the air of toxins on long space flights. Imagine how helpful they would be in your home environment. To make this article as helpful as possible, we have assumed that your home is compact, has limited ventilation (or has polluted air outside) and you are not a natural gardener. So, most of our recommended plants are smaller, hardy evergreen plants that anyone can grow. These plants were all popular indoor plants even before their air-cleaning super-powers were discovered. The florist’s chrysanthemum plant, also known as florist’s daisy and hardy garden mum, is one of the most effective plants for removing trichloroethylene, benzene, formaldehyde, ammonia and other chemicals from your home. This plant gets top spot on our list because of its exceptional cleaning powers and the beauty of its flowers. It is a compact plant that will sit nicely on a table or window-sill. Just make sure to place it where it can enjoy the sunlight. 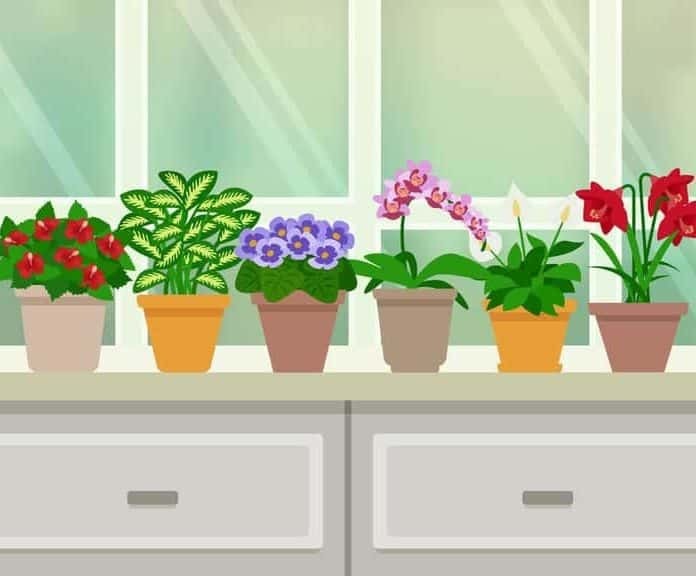 If your plant is already in bloom when you buy it, the flowers may have been induced artificially and the plant will need to return to its natural seasons in your home, so re-blooming may take some time. However, the deeply etched foliage is attractive in its own right, so you can still enjoy the plant. Make sure you buy a plant that is not wilted and as healthy looking as possible with more buds than open flowers. It might be best to re-pot the plant when you get home – in a slightly larger container so that you can spread out the roots a bit. And make sure you give the plant plenty of water – rather place it in a dish and water from the bottom to give the roots plenty of moisture. Don’t leave it in the dish though as it may get waterlogged and the roots may rot. After a good soaking, you can water it from the top daily. As good as these plants are at cleaning the air, try and help the plants where possible: Ventilate your home frequently, and limit the use of harsher chemicals, such as cleaners and insecticide sprays and even air fresheners and definitely no smoking inside the house. Clean air conditioner filters regularly and keeps dust to a minimum. By the way, certain strains of these plants will help keep insects away, as well.